One month has passed since Avalon Harbor was hit hard with a storm that claimed the lives of a Harbor Patrol officer and a local resident. The catastrophic event was rare and unexpected, according to those who spoke with The Log since the Dec. 30, 2014, storm. However, despite the rarity of last month’s strong northeast winds, inclement weather conditions and winds are a persistent reality for Avalon’s residents and boaters alike. Northeast winds will be in Avalon Harbor’s forecast again someday. What lessons were learned from the Dec. 30, 2014, storm and how can anyone who visits Catalina by boat be best prepared the next time a northeast front is forecast? Rick Stratton, who visited Avalon Harbor from San Diego for two weeks aboard his 33-foot powerboat Sanity, was caught in the storm. Stratton was asked to move from his original mooring to another location a few hours before the fateful storm arrived. He said had he remained at his original mooring, his powerboat might have been part of the wreckage. “I’ve never been through anything like this in my life. I was scared. I really thought, at one point, I’m not going to make it,” Stratton said, adding the storm hit Catalina Island for a 24-hour period between 4 p.m. Dec. 30, 2014, and 4 p.m. Dec. 31, 2014. However, the worst of it was from 9:30 p.m. Dec. 30 to daybreak Dec. 31, he said. Daniel Sipes, a boater who was at Avalon Harbor Dec. 30, 2014, said the forecast called for mild winds, at 5 to 15 knots, from the northeast. However, winds reached 42 knots during the peak of the storm, according to Sipes. As those winds picked up speed during the evening hours, Stratton said he began contemplating what to do if his boat broke free from the mooring. He described to The Log the carnage he saw just after daybreak Dec. 31, 2014. According to Stratton, weather conditions were initially calm Dec. 30, 2014, but by the morning of Dec. 31, 2014, there were steady gusts coming into the harbor. The worst of the storm occurred overnight, in between the calm and wind gusts. Stratton added as the Avalon boating community headed into the final two days of 2014, most believed the Dec. 30, 2014, storm would not be as intense as the one that hit the harbor just before Christmas. Instead, weather conditions abruptly changed by mid-evening. Stratton said the change in weather was so abrupt the Harbor Patrol had little or no time to properly prepare. “I don’t think anyone knew how bad it was going to be. They had foresight to move us over a little bit, but they didn’t move all the boats over. I’m guessing no one knew it was going to be what it was,” Stratton said. Jim Montrella of Dana West Yacht Club arrived at Avalon Harbor Dec. 29, 2014, and remained through Jan. 1. He visited with his family aboard his 31-foot sailboat H2OMan. On Dec. 30, 2014, he was on land and having dinner with his family when the winds became stronger. His sailboat was moored in shallow water near the Casino. Montrella said he was not too worried about the weather forecast, which predicted mild winds between 5 and 15 knots. However, Montrella said the winds were “blowing like gangbusters” when he finished dinner with his family at about 9 p.m. Dec. 30, 2014. He added the winds were “very, very aggressive” and most people had a hard time opening doors against the wind. According to his estimate, winds were blowing between 40 and 45 knots. As he looked to Avalon Harbor from land, Montrella noticed swells breaking just before the end of the pier. The whitewater from those swells touched the bottom of the pier, he said. By about 9:30 p.m., swells were coming in every 5 to 6 seconds, according to Montrella. “The waves were breaking against the seawalls. The wind was blowing so strong you had horizontal water blowing,” Montrella said. At about 7 a.m. Dec. 31, 2014, Montrella said waves were still breaking, but not as bad as at 10 the previous night. He observed one boat splintered into pieces, and either a generator or engine just underwater. Montrella and his wife walked around the harbor three times in search of their dinghy. However, it was nowhere to be found. 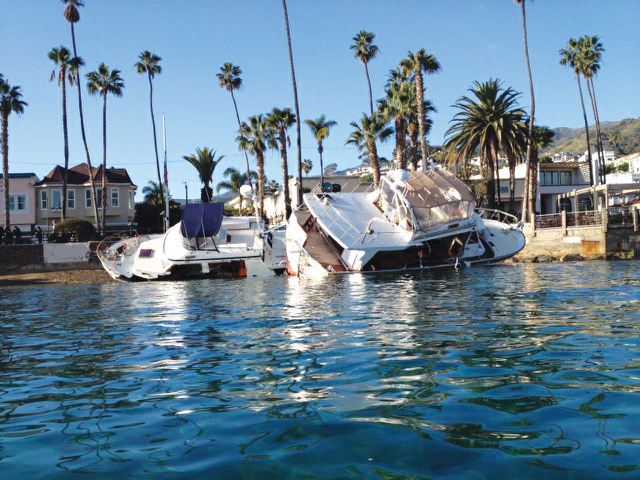 Could Catalina Harbor – which is on the other side of the island – be a location where boaters head with proper warning? Sipes said evacuation orders were issued during high wind events in the past. However, mild winds were forecast for Dec. 30, 2014. The Harbor Patrol merely relocated boats to shallower water. One boater said boats were relocated to make it easier to ride out mild winds, not survive a severe storm armed with strong gusts. Accordingly, what are the lessons learned from the Dec. 30, 2014, storm? What can boaters do to be best prepared for a sudden shift in weather conditions? Stratton suggested the city of Avalon could build a breakwater in front of the harbor in order to protect boats from future storms. In a narrative submitted to The Log, Daniel Sipes said he would not stay in Avalon Harbor whenever northeast winds were predicted, even if the winds were forecast to be mild. Montrella commended his friend, Alex Hunter, for double mooring his boat. Hunter rode out the entire storm with his wife, Laurel, at the helm of their boat, Cheerio. A boat moored on Cheerio’s starboard had left the morning of Dec. 30, 2014. When the forecast called for northeast winds, Hunter asked the Harbor Patrol if he could double moor Cheerio, using both the mooring his boat was on and the adjacent one just vacated. “We thought the second mooring would give us the extra protection. Had we not done that, I’m convinced we would have broken from the single mooring,” Hunter said, adding a boat on his port side, a 38-footer, was attached to a single mooring and ended up on the beach. Hunter, whose boat was roughly in the middle of Avalon Harbor, said the water and wind were calm at around 5:30 p.m. By 8 p.m., the winds picked up. About two hours later, the Harbor Patrol started to unhook dinghy docks. During the peak of the storm, the waves became too big to get onto a dinghy and head to shore. Accordingly, Hunter asked his wife to get ready and be prepared. They put on life jackets. “We decided to ride it out as long as the mooring appeared it would hold,” Hunter said, adding the storm briefly calmed down around 2 a.m. Dec. 31, 2014. The storm picked back up about 4 a.m., with swells reaching 10 to 12 feet and occurring every 2 to 4 seconds. Hunter said he and his wife were finally able to get some sleep by about 6 a.m., when the storm started to calm down again. By 10 a.m., the water was calm. With their dinghy attached to the boat, the Hunters headed back to shore. “My best advice would be if the weather forecast is northeast winds, I would leave Avalon Harbor and head to Cat Harbor or head back home. If you decide to stay, definitely pick up a second mooring. It definitely saved us. Or get the Harbor Patrol to move you to a more protected spot in the harbor before the storm comes,” Hunter said. In addition to recommending a double mooring, Montrella suggested boaters request to be moved closer to the Casino, where the water is shallower and the harbor is better protected. Looking ahead, Montrella said perhaps the National Weather Service, as technology continues to develop, might be able to do a better job of predicting wind intensity.